A sinus infection, or sinusitis, is one of the most common chronic illnesses in the US. It affects 30 million people every year and occurs more frequently than heart disease. The sinuses, which are cavities located around the nose, produce mucus that drain into the nose and down the back of the throat, helping to keep the nose free of pollutants and debris. When a virus or bacteria infects the mucus in these cavities, nasal passageways become inflamed and swollen, and the normal flow of mucus from the area is impeded. Sinusitis can cause mild to severe headaches, pain in the sinus area, nasal congestion, and a runny nose. Properly identifying why you are experiencing sinusitis is the first step in properly treating it. 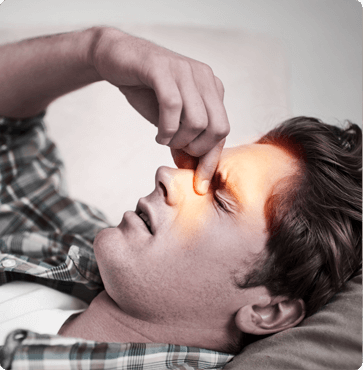 Acute sinus infections often occur after a cold or allergic reaction. Chronic sinusitis can be caused by infections as well as passageway obstructions such as nasal polyps in the sinuses or a deviated septum. In most instances, sinusitis will clear up on its own and treatment efforts are focused on relieving a patient’s symptoms. These therapies include decongestants, nasal sprays, and over-the-counter pain-relieving medication. Your doctor may prescribe antibiotics in some instances. When allergies contribute to repeat or severe episodes of sinusitis, allergen immunotherapy (allergy shots) can help alleviate your symptoms and prevent recurrence. Contact ENT & Allergy Center of Austin at (512) 328-7722 for more information on sinusitis, including the treatment options offered at our locations in central Texas: Westlake, Cedar Park, or Round Rock.